Bodega Colomé was established in 1831 and is not only the oldest working winery in Argentina, but also the owner of the world's highest vineyard. Perhaps because of this great tradition, which is allied to the dynamism it displays today, Colomé was chosen by Tim Atkin as one of his 'First Growths' in the classification of Argentinian wineries he made for his 2016 Argentina Report. 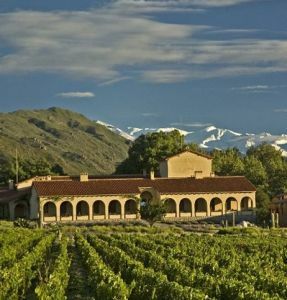 The winery is located in the far north of Argentina in the Upper Calchaquí Valley and is thought to have been founded by the Spanish Governor of Salta, Nicolás Severo de Isasmendi y Echalar. In 1854, his daughter Ascensión, who was married to José Benjamín Dávalos, brought the first French pre-phylloxera Malbec and Cabernet Sauvignon vines to Colomé. The three vineyards (with an area of four hectares each) were planted in the same year - the fruit from which is still used to make wines. There are currently 140 hectares planted at altitudes of between 2,300 and 3,111 metres above sea level. The grapes are sourced from four vineyards: 'La Brava' (at 1,750 metres) in Cafayate, 'Colomé' (2,300 metres) surrounding the winery, 'El Arenal' (2,600 metres) and 'Altura Máxima' (3,111 metres). Both 'El Arenal' and 'Altura Máxima' are located in the Payogasta area. Grapes grown at high altitudes have thicker skins, in order to protect them from the intense ultraviolet rays. As a result, the wines have more colour, aroma, flavours and antioxidants from the increased phenolics. The altitude also contributes to a wide diurnal temperature range of more than 20°C. The warmth of the day ripens the grapes and the coolness of the night preserves acidity and fragrance..